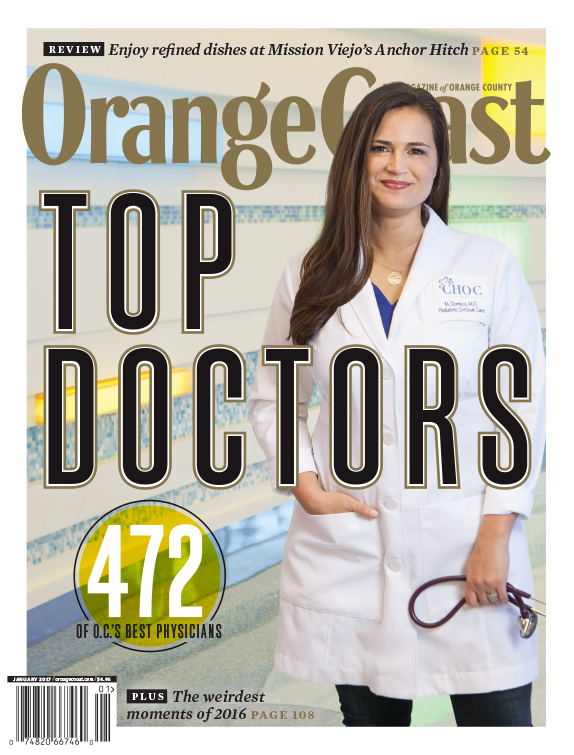 Top Docs The OCMA list of top doctors, with five features about local residents and their medical tales, including the woman who was bitten by a shark in CdM this year, a family who lives at Miracle Manor near CHOC, a man paralyzed in a boating mishap just regaining some arm movement, a woman who received a kidney from her niece after the niece died and a UCI med student who volunteers for a needle exchange program. Person of Interest Sandy Marshall, Laguna Beach resident who started Project Scientist, a STEM camp for girls age 4-12 five years ago. What motivated her and how is the program going? Hip Hoods Santa Ana, but not where you think of as Santa Ana. We’re visiting the area off Harbor across from Whittier Law School. Featured eateries: The Scotchery, Musubiya Balls and Burgers, 5ifty Forks (the Art Institute culinary school), Tommy Pastrami. Perfect Getaway A trip to Phoenix to take in the Sonoran Desert at night and in the cooler winter. Culturephile Lynne Cox, a record breaking swimmer, has a new book about her time taking care of her aging parents and how she was motivated to get back to what she loves….. the ocean. Arts Kerri Sabine-Wolf, Tustin painter and butterfly expert shows beauty and violence in one piece. Don’t Miss Our events page featuring lineup for the holidays, including Matilda at Segerstrom and Itzak Perlman, as well as Ladysmith Black Mambazo at The Barclay. O.C. Style Opener Smart watch from local watchmakers, Nixon. Tastemaker Cynthia Vincent, the consultant for 3dots in Garden Grove and for O’Neill. Hot Shop Gorjana, the new brick and mortar for the already popular OC jewelry line in Laguna Beach. Main Course: Anchor Hitch in Mission Viejo. Come for the food, stay for the food. The location and ambience leave much to be desired. OC’s Best: Best bubble tea places. We look at six with all kinds of delicious additions. Dining Guide Our guide to many of our 200+ recommended restaurants. We’ll also have short spotlight features on the Aveo at Monarch Beach Resort and the lovely Water Grill in Costa Mesa. My O.C. A woman’s lifelong romance and then battle with Ortega Highway. Answer Man Three local trivia questions: Beachwear restrictions in Newport, the origin of eucalyptus trees here and our NOT being named for orange groves.